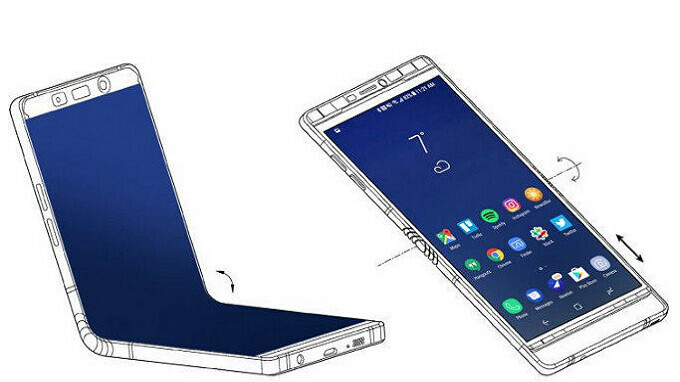 With the Samsung Galaxy S10 now rumored to hit the light of day at CES 2019, there is now talk that Samsung's eagerly awaited foldable phone will be unveiled the following month in Barcelona at MWC 2019. Yes, it is hard to look ahead at events planned for next winter, just as the weather is turning warm in the U.S. The foldable phone has been dubbed the Samsung Galaxy X, and carries the codename of "Winner." Previously, the device had a development codename of "Valley." This change is an indication that the device has gone from a long term development project, to having a slot in the manufacturer's 2019 lineup. Samsung reportedly brought the Galaxy X to CES this year. The device seen in Vegas is believed to have featured a fold-in design with three 3.5-inch OLED panels; one screen is on the outside of the phone with two on the inside. When the two inside screens are open, it creates a larger 6-inch to 7-inch screen. The display outside the phone is used to interact with the handset when the device is closed. Considering the use of 3.5-inch OLED displays, as a point of reference the Apple iPhone featured a 3.5-inch screen until the 4-inch iPhone 5 was unveiled in 2013. Keep in mind that the model Samsung allegedly showed to its partners in Vegas may have nothing to do with the final version of the phone. Earlier this week, Samsung received a patent for a foldable phone that folded-in and contained two screens inside. A special hinge uses a sensor to contort the device into pre-set configurations. So would the outside screen just be for notifications or be able to do everything? Innovation at it's best. But I am not interested in this at all. I hope it has an actual, flexible, flodable display and not like how the ZTE Axon M folds. They should make a e-ink display on outside body rather than making it a clamshell phone with a outside screen.It will look good on it. I am amazed by the concept, eager to see it...and the engineer in me is wondering how they have solved the durability/scratch resistance issue at the screens folding axis. Who need 3.5 inch screen ?? Even when the inside screen are open 6 or 7 inch isn't something great! Now the Note 8 has already 6.3 inch display! They should do something better and more exciting! Might come in handy for drawing, "text-to-speech" functionality, or simply viewing notifications & selecting pre-installed text mags...Much like the features that'd contributed to the success of the gear S3. I think it's yet another useless invention like curved screens. Something hard to do technically, but with no useful application. Uh, isn't that physically impossible? If you combine two (since the third is stated to be on the outside) 3.5 inch screens, the largest you will get is 4.6 inch, according to simple math. And that's so small for all that hassle in an age where the average is already past that point, that this rumor could be deemed false to begin with. To get a (near) 7 inch screen when unfolded, you need two 5.3 inch screens. Just mocked it up in Illustrator, and with (2) 3.5" screens 1.72" wide the combined diagonal size came out to be 6.34". So depending on the final screen ratio, I'd say 6 to 7 inch total screen is correct. If you consider both 3,5" screens to be square or close to it, you're looking at 5,5" combined screen at least. Yes, which is still a far fry from 6 to 7 inch. And still smaller than a current S9, when unfolded. Not going to happen. The article never said 7 inch, check again and you'll find "it creates a larger 6-inch to 7-inch screen"
No, only if you double the long end, which gives you a 1:3.55 ratio, useless. Doubling the short end is more likely. And before anyone mentions it, a starting point closer to a square, means closer to a 5.5" total when unfolded, well under 6 to 7 inches. Basically anything smaller than a 3:1 final ratio when they do hinge at the short end (thus doubling the long axis), results in less than 6 inches. And such a ratio is very unlikely. Even their patent drawings show squares or close to squares before unfolding and some hinged at the long end. No offense Samsung, but this sounds incredibly stupid. I’d rather you didn’t waste R&D on this “project” cuz it is gonna flop. Hard. Samsung know what's gonna flop or not better than other. Yes it will flop if you only view it from profit/sale perspective. Actually 2 screens. The main one being foldable and measuring 7" when opened up. If it uses 3 screens, it isn't using a foldable screen.